Karen Woodward: Is There Such A Thing As An Aspiring Writer? Chuck's snickerdoodle of writerly goodness brings up an interesting topic. What is a writer? On the surface it's seems pretty easy: a writer is someone who writes. It doesn't matter if you've ever been published, it doesn't matter if you've sent any of your work out to be published. If you write, you're a writer. Clearly, if a person never publishes they can't use the money from their work to support themselves so they're not a professional writer. But that's okay. Of course there are still things to figure out. For instance, what if I only write one day a week? What if I only write one day each month? Each year? What if I just intend to write and never get around to it? We can look at a person with a full head of hair and say, with confidence, "Not bald," and we can look at another person who lacks any hair and say, "Bald," but what about the in between cases? What about someone who has some hair but is follicly challenged? I suppose the temptation is to call someone who likes the idea of writing, or perhaps of having written, but never gets around to actually writing, an aspiring writer. It's an inclusive term, it cheers a prospective penmonkey on and reinforces their desire to write while acknowledging it hasn't happened. Yet. That's how I take it, the graphic Chuck made, as a call to aspiring writers to get rid of the "aspiring" part of their self-definition and sit down, face their demons, and write. A lot of writing isn't easy and it isn't fun. It's hard work. It's about bleeding on the page, about reaching inside yourself, looking at your demons, and then putting those most intimate parts of yourself on display for anyone to see and comment on. When a person says they're an aspiring writer it means they want the afterglow of looking at the words birthed without going through the labor of producing them. They want the thrill of looking at their name on a book without the gut-wrenching terror of realizing their most intimate truths are available for perusal for the cost of a few dollars. Sometimes I think writer's block is less a malady as it is a call to sanity. And yet ... I can only remember one writer who ever retired. Many say they will--they threaten to, they dream about it--but most never do. There's something about the thrill of getting it right, of being able to communicate to someone else exactly what one intended. Of the transmission working and having just the effect one wanted. But, really, much of the time writing is just putting one word after the other, even when it feels as though you're writing something as interesting as cardboard. It means writing, and finishing what you write, even when it doesn't feel glamorous, interesting, agonizing or exciting. For great writing about writing, see Neil Gaiman's NaNoWriMo Pep Talk and his 8 rules of writing. What about you? What do you think of the term "aspiring writer"? Is it a monstrosity of nomenclature or a useful term of inclusion? 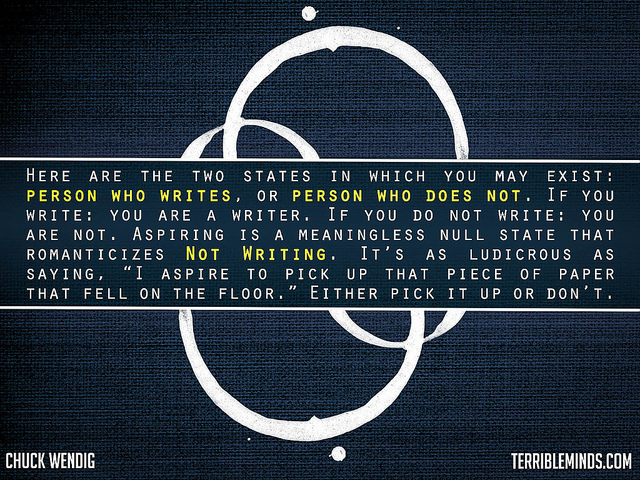 Photo credit: Chuck Wendig (aka Curious Spider) licensed this (see the top of the page) graphic (On "Aspiring" Writers...) under a Creative Commons license: Attribution-NonCommercial-NoDerivs 2.0 Generic. This means that as long as you give Chuck credit for making it, don't make money off it, and don't change it, you can use it however you like. I don't use aspiring anymore, haven't for a long time. Same thing when I was in theatre -- after a point it becomes ridiculous to say you are an aspiring actor. As soon as I was in a few plays, I dropped the aspiring and concentrated on the next round of auditions. With writing, I think you can aspire to many things. I think of myself as a writer and have published fiction and non-fiction, but I still don't call myself a novelist on an author yet -- because I don't have a novel published. I think the question for me is whether you do what you say you "aspire" to do -- and Chuck's analogy of picking up the piece of paper seems just right. I think I draw the line at "novelist" for myself, because even though I have a complete draft, it's not published, and publication is part of the definition, to me. Besides, it is possible to be an aspiring novelist (someone who wants to publish a novel) and author (someone who wants to publish anything), but to be an aspiring writer ... it just doesn't make sense. There's nothing to STOP one from writing ... except writers block, which is both serious and no fun. So I guess there is, it's not completely clear cut. But, in general, since all a person has to do to be a writer is to write every once in a while it seems absurd to say that one aspires to do it.